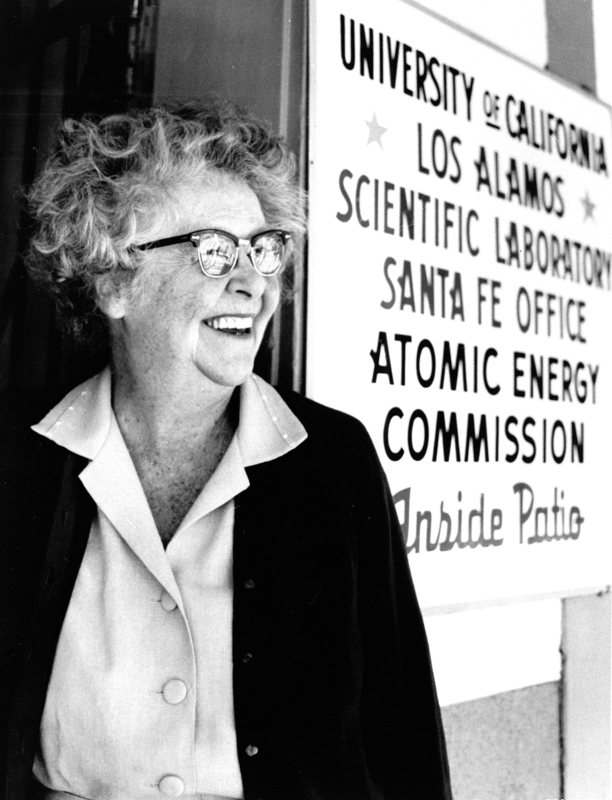 Dorothy McKibbin was known as the “Gatekeeper to Los Alamos.” Everyone and everything who worked on the Manhattan Project at the site had to pass through her office at 109 East Palace in Santa Fe. Her important position as well as her friendly disposition helped her form lasting relationships with many Manhattan Project workers. In this interview, McKibbin discusses what happened to the scientists after the project, and details some of the stringent security procedures at Los Alamos. She also characterizes Oppenheimer as a charismatic and kind leader beloved by the community, who did not deserve the harsh treatment he was subjected to during his security hearing. She also describes how many of those who worked with Oppenheimer supported him, and some even tried to intervene during his hearing to no avail. Sherwin: Have you lived here all your life? McKibbin: No, I’m a Middle Westerner. I was born in Kansas City, and I went to Smith College at Northampton, Mass., which was marvelous. My brother went to Princeton. Yhe man I married, Joe McKibbin, graduated from Princeton. My cousin went to Princeton. My father went to Boston University for law, because he felt at that time it was better than Harvard. So, I’m used to this Eastern education, and I think it’s terrific. But then, I married Joe McKibbin and lived in St. Paul. He died after four years, and I had a son who was then ten months old. I came out here to live, because I had been here previously with a touch of TV—TB. Not TV, everybody’s got TV now. I was told to come out here and ride horseback for a year and I’d be all right, by the Middle Western. I was visiting in Detroit when I found this out, those doctors. So my mother and I came out. I felt that Santa Fe must be a lovely place, because it was near Taos and I’d heard there were artists in Taos. I felt it’d be a nice place to go. My sister, who was five years older, had had tuberculosis and had it cured in California and died in Denver. I said I’d never have it, of course, but I did. So I wanted to get to a new, strange place, and my mother and I came out and took a couple of rooms at La Fonda. The population of this town then was 12,000. Sherwin: What is it now? McKibbin: Seven Spanish and five Anglo. Now an Anglo, Mr. Sherwin, is anyone who isn’t Spanish. He could be Irish or Swedish, or he could be Black, he could be from Africa. He is an Anglo, because he isn’t Spanish. Spanish are also called “Natives.” We make a great distinction between our natives who are Spanish American, and the Chicanos, who are part Indian and Texas and Spanish. McKibbin: And Mexican, yeah. There are some great old families that came up the old trail, and it’s been a delightful place to live. But in regard to climate, it’s just terrific. It’s very cold in winter with lots of snow. Sherwin: How cold does it get? McKibbin: Well, it gets down to zero. Doesn’t stay very long, and it melts off here, but in the mountains we have a base five-foot average all winter for skiing and so forth. Sherwin: Yeah, up in Taos, it’s supposed to be wonderful skiing. McKibbin: Yeah, it’s marvelous. We have a ski run just sixteen miles up. You can see from this back portal where it is. My son was brought up on skis ever since he was six years old. It’s been a great place to live. Sherwin: Boy, we certainly are enjoying it. In fact, we worked our way up from Albuquerque. First, I went down to Socorro. McKibbin: Well, now you’re an instructor, a professor at Princeton? Sherwin: So I guess I fit in with your family. McKibbin: Oh, another brother went to Williams. Sherwin: Oh, that’s okay. I went to Dartmouth myself, so of course I know students there very well. McKibbin: Oh, I had a suit, a tweed suit, that took the first prize on costuming at one of those skating fiestas. I wasn’t there, and I wasn’t in it, but I lent it to a friend of mine, who was very attractive, and she took the prize. McKibbin: Yeah, the winter carnival. Sherwin: Yes. Well, that’s changed a bit. McKibbin: I bet it has. Sherwin: Probably for the better. It’s very nice up there. This is a lovely country. Happily, I sort of had an unfortunate set of timing and I’m now convinced that it’s a very fortunate thing. When I arrived in Los Alamos to look at the files of the Manhattan Engineering District that they have there, I was told that I couldn’t see them because the—have you followed that Progressive Magazine? McKibbin: My sight is nearly gone. I can’t read anything, newspaper, magazine, or letters. I can read large print and I can see stuff on TV, but rather mistily. That’s the only way I keep from being illiterate. People read me the news every once in a while and tell me what’s going on, which is bad enough. Sherwin: Well, very briefly, Progressive Magazine, which is published out of Madison, Wisconsin, did an article about three months ago on—or was ready to publish an article—on how to build a hydrogen bomb. The government placed prior restraint on it through the courts. The courts ruled in favor of the government. There was a tremendous flap about this, as you can imagine. Sherwin: The Progressive’s argument was, all this information was gathered from public documents. To prove that, they sent an ACLU lawyer to Los Alamos to go over the research to show that these were all public documents. Well, he came across a document at the Los Alamos library, which was declassified, which clearly never should have been declassified. It was, in fact, a key to unlocking some of the technical secrets about how to put this hydrogen bomb together. He had it out for about two hours when the librarian realized the importance of this document. He went out to lunch and they took the document away, and they closed the entire library for research about six weeks ago. McKibbin: Yes, I heard of all of this briefly, but I didn’t get the name of the liberty magazine in my head. Sherwin: No, I wrote to [Delbert] Sundberg. McKibbin: Sundberg, Del Sundberg, yes. Sherwin: Yes, Sunberg. Although I just wrote the head librarian at the time, I didn’t have a name. After I left to come out here, a letter arrived at home saying, “Don’t come, because you can’t see anything, because we have to re-classify everything.” Well, I was here and they have done their best to at least let me see some things, which have already been re-classified, and they’ve been very helpful. But there’s a lot of stuff that I have to come back to see. This is just a very long-winded way of saying that I will return, and I’m delighted that I have to return. McKibbin: When do they think they would be able to let you in? Sherwin: Oh, the process is a slow one, but I don’t know. That’s not clear. But I have so many people to see in Los Alamos. There are many more people still around than I had suspected. McKibbin: Whom are you talking with and have talked with? Sherwin: Well, I have talked to [Charles] Critchfield. Sherwin: Well, no he was out of town. Carson Mark was out of town. McKibbin: Those both would be excellent. Sherwin: I have talked to [Stanislaw] Ulam. Sherwin: I very much want to talk to John Manley. McKibbin: Yes, he’s easy to get. He’s retired, unless he’s gone away. McKibbin: He is a close friend of Robert’s, and was one of the initial people out here who helped them set the whole thing up. McKibbin: Louis Rosen would be very good, head of the Meson facility. He might let you go through that facility, which is a half-mile long. Sherwin: Right. I passed it on the way to Los Alamos. McKibbin: On the back road, yes. Sherwin: Dr. Ulam took me by to explain what it’s all about. McKibbin: Yeah. They also have been working on cancer for a long time, leukemia and Hodgkin’s disease. The health division up there is, to me, one of the most important in the world. Dr. [Morton] Kligerman, a radiologist—Stan may have told you of him. McKibbin: He was hired by Harold Agnew to come out here, leave Yale. He’s in charge of this cancer research at Los Alamos in the Meson facility and at the University of New Mexico, which does a lot of work with Los Alamos, and the cancer development connected with the university. They have a new building there. Sherwin: —having a medical school attached to it. McKibbin: —development like that. I mean, it’s a wonderful lift to the spirit, which suffers, I’m sure, more than the body does when you’re going through that. I understand the graphs he makes. He has several people from Japan there, too. They’ve done a lot of work in this. They’re not sensational at all. They’re very low-key and very average, because he is a scientist, and he doesn’t want to shoot off any firecrackers until he knows what he’s shooting. This would be open to people going through and so forth. First off, what do you teach at Princeton? Sherwin: Quite a few writers around here. McKibbin: Oh, yes, and artists and painters and independent people. It’s a very cosmopolitan place. People stop here on their way west and east and so forth. John Galsworthy was here years ago with Witter Bynner. Stella Benson, that lovely English writer, was here. Edna St. Vincent Millay lived on Camino and La Del Sol in the Arthur Davison Ficke house one summer to finish the “King’s Henchmen.” Alice Corbin, the poet, lived here. She and Harriet Monroe put out the magazine, Poetry from Chicago. McKibbin: And lots of painters. Randall Davey, a member of the American Academy of Art and the Cinco Pintores and so forth. Well, let’s don’t get into that. Do tell me how you got interested in Oppenheimer. Sherwin: I was looking for a dissertation topic as a graduate student. This may sound a bit corny, but I asked myself, “What do I think is one of the most important things that’s happening in the world, the history of which would be useful to write about?” Nuclear weapons was my answer. McKibbin: Yes. And nuclear reactors. Sherwin: As a historian, I couldn’t write about the current situation, back in 1966 or ’67, and I worked my way back to—I first came across Leo Szilard as an interesting case. I got very interested in the whole question of the influence on science, of scientists on foreign policy, and worked my way back eventually to the Manhattan Project. I wrote a dissertation originally, but then it became a book called The World Destroyed. It was about the atomic bomb and the Grand Alliance, and it’s a book that talks about how both the scientists on the one hand and policymakers like [Franklin] Roosevelt and [Winston] Churchill thought about this development, and what they thought its impact on the post-war world would be. The conflict and debate and mixing of opinions and ideas. A lot about Niels Bohr. Not all that much about Oppenheimer, but I learned enough about him, and of course, had always been interested in him, because I’m interested in American politics. For my second book, I decided that I wanted to stick with the area of science and nuclear energy and weapons, but I didn’t want to do a sequel, son of a The World Destroyed in 1945 to ’50, the same kind of thing. McKibbin: Was the son of The World Destroyed Oppenheimer? Sherwin: No, no, I’m saying, I did not want to do Son of Tarzan or something like that. Sherwin: You know, the same kind of thing. So I worked my way towards Oppenheimer. McKibbin: Well, you hit the right one. Sherwin: I think so. I just think it’s an absolutely marvelous, marvelous subject. Did you first meet him when he came here for the Manhattan Project, or did you know him before, from the summers he used to come out here? McKibbin: I didn’t know him in the summers. He and Frank [Oppenheimer], who’s eight years younger—and Frank, by the way, has cancer. Do you know that? Sherwin: I have heard that recently, but I didn’t know that when I talked to him in January. McKibbin: He’s been taking chemotherapy and then it made him so sick. He’s in a slighter thing, but he feels better. Jackie, his wife, is desperately ill with cancer and heart. They’re out in Sausalito. Sherwin: Yes. I was at their home when I spoke to them. Sherwin: Her cough. She had a terrible cough. Sherwin: They both looked okay in January. McKibbin: Yes, I know. Well, they’ll look that way until they fall over, I guess. They’re terrific people. Sherwin: What kind of cancer do they have? McKibbin: Well, they just say for Frank it’s all over him, and I don’t know about Jackie. She’s had very serious heart attack, too, in the last year. She’s very vital and vigorous, so she must be quite ill. Frank and her daughter, Judy, visited here this summer. She’s a pediatrician and she’s Dr. Judith Oppenheimer, lives in San Jose, a perfectly beautiful young woman. She had grown up at Los Alamos and knew Dr. Valerie Freedman, who was a pediatrician. She was visiting with her. They came over to say hello, and she said this may be terminal with her mother, it may not. But she’s awfully sick. Then there’s the son named Mike, and that’s all. McKibbin: Well, he had been up in Washington State, and I think he’s moving down to be closer to them now, I think. Have you gotten hold of Peter [Oppenheimer]? Sherwin: I spoke with Virginia [Oppenheimer]. Sherwin: I’m supposed to call back tonight and see if I’ll have a chance to see Peter this weekend. McKibbin: Didn’t she think he was probably going to be there? Sherwin: Yes, she did. I think the question is whether he wants to talk about his father. McKibbin: He is very, very shy. Sherwin: I know. I’ve heard. McKibbin: The BBC came on. They’re doing a nine-sequence play on Oppenheimer, similar to the one they did, the five-sequence on Madame [Marie] Curie. They knew more about Los Alamos, the atomic bomb than any of us. They were terrific young people, and they wanted to see Peter, and he refused to see them. He told me later, he went over there and Virginia was there, but Pete didn’t show up when they were there. Anyhow, he said that he knew many books had been written about his father and he talked to a lot of people, and he thought that he just wouldn’t talk. He told me that he thought they were going to run something like “60 Minutes” and put him on TV and ask him questions about his father, and this would paralyze him. He’s very shy, and I don’t blame him. I didn’t know he had that idea. I wasn’t making the arrangements. They were made from Los Alamos through the BBC before they came out, and then the BBC boys called him and all that stuff. But he’s very shy. Now, a man named Peter Moore, who’s written a book on his father, hit it off beautifully with Pete and went out to see him, and Pete had him spend the night and they just had a great time. McKibbin: Yes. Peter Michael Moore. McKibbin: So I just say good luck to you. He’s a charming and sensitive and lovely young person, very, very handsome, very sensitive. They have three children now. Sherwin: They just had one, didn’t they? McKibbin: Yes, quite recently, about two or three months ago. Pete went this past weekend—I may have told you—to see Frank and Jackie in Sausalito and says they’re coming along pretty well. Sherwin: But I’m very sorry to hear that. I hadn’t realized it was so serious. McKibbin: Well, you see, Robert always suffered from trouble with his lungs. I don’t think he ever had TB, they just called it lung trouble. Lived in New York, and his mother, whom I didn’t meet, she was dead by the time I came on the scene. But Katherine Page Kavanaugh, who owns the ranch called Los Pinos up on the Pecos, is where Robert and Frank would stop when they would ride down on horseback from Colorado, no less. It was a dude ranch with about fourteen rooms. Sherwin: Is it still in—? McKibbin: Not owned by her. She is no longer living. Someone has been running it, but I don’t know who and I don’t know what shape it’s in. I imagine there are a lot of houses built around and trailers parked around it now. I don’t know. Sherwin: The name of it is Los Pinos? McKibbin: When you see Peter or Virginia, if you just go up the road about five miles, you will run into it. It’s up where Cowles is. That’s the end of the road. McKibbin: It is there on the road just as you get there, and they’re only about ten miles from Cowles. McKibbin: I think if you’re up there, you ought to see it. Sherwin: Oh, I definitely could. That’s a very nice thought. McKibbin: Robert loved that place and he rented it during the war and they went over whenever they could. Both he and Kitty were great horseback riders. She had a beautiful horse. I think it was a racer called The Duchess, and she rode that horse. Robert had a horse and they would ride over, down the valleys and up the mountains here with other friends like Louis Hempelmann and his wife, Eleanor Hempelmann, who live in Rochester now. Sherwin: Right. He’s a doctor at Strong Memorial Hospital. McKibbin: Yes, he’s just retired and they’ll be out here in August. They bought a little house out here. Sherwin: They’ll be out here permanently? McKibbin: Well, the house is a permanent possession, and I don’t know. Louis was on that commission formed by the AEC to study results at Hiroshima and study Japan year after year and day after day to see. Whether he’s out of that now or not, I don’t know, but he’s a very bright and active man. I don’t know. If you ask me, will he come out here forever, I have no idea. Sherwin: The reason I ask is I was planning on being up on in Rochester for other business in August, and I had just learned from the records at Los Alamos that he was from Rochester and at Strong. I thought I would see him in August, but you say he’s going to be out here. McKibbin: Well, now, Virginia’s the one who told me on the telephone the other day that they were coming in August, but no one ever knows. So, you could do a little research on that and call their home and make an appointment either there or here. He’d be a very good person to talk with. He took care of Pete and Toni during the dreadful trials, the purge, the disgrace. They feel very close to the whole family, and the Hempelmann’s particularly, of Peter and his wife. Because they’re the only Oppenheimers left, you see. Robert would come out to that place and live there, and the people in town just adored him in the drugstore and the grocery store, this guy in a porkpie hat and a blue shirt open in the neck and jeans and boots. They didn’t know anything about him. Neither did anybody here know anything about what he was doing. The choice of him as leader of this project saved it by many, many months and saved it for the world. McKibbin: See, this wasn’t a court, this was a kangaroo affair. Sherwin: No, it was the equivalent of the European purge trials. McKibbin: That’s what I call them, exactly, Darkness at Noon. McKibbin: It wore him out, and he fought it, but it just wore him out. He wasn’t used to a prosecutor that—“What did you say? Why did you do this?” He had not associated with people like that ever in his life. They had a criminal prosecutor named [Roger] Robb, who’s now, I think, a judge. McKibbin: How did he get that appointment? Sherwin: From their point of view, did a good job, and he was a Republican and he was rewarded. McKibbin: One of the most famous scientists in the world, and he was sitting in this house, said that he was ashamed for the first time in his life of the government. That’s about as far as we ought to go now, because it really kills me. Since then, if you’ve read other things about Robert, his spirit was just gone. He knew the result of it and he was very polite, and it was a farce to him. Sherwin: Yeah, he called it a farce. No, it was absolutely a terrible thing. McKibbin: He was hounded all through—he told General [Leslie] Groves and these guys before he accepted the job that he didn’t think he should, because of one, two, three, four, five, six, seven, and they all knew it. Groves has stuck by him and I think Groves is simply wonderful. They cleared him again in ’47, but the McCarthyism had not only Eisenhower but everybody scared to death. This came at the wrong climate for Robert, for a dreamer and a poet and a man who really wanted peace and gave his life for it. Sherwin: Yes, no question about it. McKibbin: You know, it’s well-known that he weighed 113 pounds when the project was over, and he always had a cough that would wake the dead. And he got the cancer in the throat. Sherwin: Yeah. I talked a great deal with Francis Fergusson. McKibbin: Yes, he’s such a close friend. Sherwin: Yes. That’s been extremely helpful. Of course, he was around during the time Oppenheimer was going through that awful, awful period, and he described a great deal. But they were much happier days here during the war. McKibbin: Yes, because Robert’s brain was in on everything. Everyone consulted with him, and he was the man who did it. He spoke so clearly about everything that everything you read about him, he could just see a subject before it was half out of the mouth of the person who was telling him about it. McKibbin: Terrific vision about it. The people loved him up there. The fire chief told me, he said, “Hell, I could go in Oppenheimer’s office any time I want to and spit on the floor, when it wasn’t full of Nobel Prize winners.” I don’t know that that would have stopped the fire chief, but I mean, that’s Robert. I mean, everybody’s just devoted to him. Sherwin: He was just so open during that period. Sherwin: So on top of everything. Sherwin: He could show the right qualities for every type of individual he had to deal with, I guess. When did you first meet him? McKibbin: Enemies just clobbered him. Not the people that believed like him, they just clobbered him because he was more spectacular and they couldn’t stand—their egos were hurt to have someone so glamorous, and the glamour not focused on some of themselves. They just couldn’t stand it. Sherwin: Right. That was [Giovanni Rossi] Lomanitz and [Joseph] Weinberg, or [David] Bohm. McKibbin: Yes. It was all so ridiculous. It was such a farce, but it was certainly wearing on him, and on Kitty and on the whole family. I knew him when I was employed to work at Los Alamos and was in his office in 109 East Palace for twenty and two-tenths years. So I remember a whole lot about it. I wasn’t going to write a book, because so many had been written, and I didn’t think it’d be very good and so I resisted it. We were never allowed to keep any writing overnight, not even the carbon paper of a typed letter. That had to be burned at 5:00 PM. Security was so tight where we were down there that, boy, it was great experience. We had wonderful training. I knew him then. They had about five offices around this courtyard at 109 East Palace, which were hired by a man named Bradley, and he had exclusive on it, and his name was Oppenheimer. We were so secret in there that Mrs. Martha Field, who owned the property and rented to Mr. Bradley, the day that Truman announced that the bomb that had hit Japan was manufactured in the northern mountains of New Mexico, a place called Los Alamos, our landlady came rushing in the back door, just tearing in, and said, “So that’s what you’ve been doing!” She was doing more work of her own. She had a little office two doors up that took care of visiting military, WACs, and men, too. Sherwin: The WACs were the ones who were the drivers, mainly? McKibbin: Not always. There were some WAC drivers, but not the Los Alamos WACs. She had a little office, American Woman’s, AWVS, Service something. If they were passing through town, didn’t know where to eat or what to do or if they lost their suitcase and they wanted a place to sit or wanted advice, she gave it. It had nothing to do with Los Alamos. McKibbin: It’s just that she owned all those properties. Sherwin: Now, did you know what was going on up there? McKibbin: No, not for a long time. Sherwin: But you did know before the war ended? McKibbin: I had an idea, yes. Sherwin: How did you first meet Robert? McKibbin: Well, I’m putting this in the book, and I’d rather not tell you, to tell you the truth, because this book ought to be out in a year. McKibbin: But it was my meeting with him that decided me on taking the job. That’s all I can say about that. And that’s the way everybody else felt that worked for him. Sherwin: Did you see him often? McKibbin: The offices were at 109 East Palace. You should go down there and look at it. Have you? Sherwin: No, I haven’t. I will when I go back. McKibbin: Here’s the Governor’s Palace, and this is East. There’s Washington Street and then there used to be a filling station, but it’s a shoppe. Then there’s an alley and then there’s a long row, a building with big, one portal for the whole thing. The first one is 109 East Palace. If you walk in the courtyard, you will see back of the court, on the door is a plaque saying, “Through these doors passed the scientists who made the atomic bomb,” and so forth. It’s a residence now, and it isn’t well kept up. It’s next to a little place on the sidewalk called Travel Service Everywhere, and it’s right in that patio. You ought to see it, because everybody who left the Hill, all the scientists, they couldn’t take their cards with them, the identification cards, their passes, because of the secrecy. So they leave them there and come down through Santa Fe and either take the train at Lamy or the plane in Albuquerque. When they came back, they had to stop in my office to get a temporary pass to get through the gate to get their permanent pass. McKibbin: As you’ve heard, all the automobile licenses were in numbers, not names, and boating things were not named and so forth. The security operation was fantastic and fabulous, and I saw a lot of it. Sherwin: Who were the security officers that were around, if you know? McKibbin: Well, the G2 [Military Intelligence] could get to my office in about fifty-nine seconds, and the FBI and then through my office to get their passes would be Treasury, U.S. Treasury, Intelligence, Naval Intelligence, Air Force Intelligence, Army Intelligence. Sherwin: Do you remember the names of any of the security officers? Sherwin: Major [Peer] de Silva? McKibbin: Oh, yes, he was up on the Hill. Sherwin: Did you ever meet him? McKibbin: Oh, yes, yes. He lived there. These are people who didn’t live there, that lived in Santa Fe, the G2. Sherwin: Right. What was de Silva like? McKibbin: Well, he was a slender young man, very nice and a very handsome wife. He was pretty good, I guess. But, Groves was the dominating figure there, and his colonels like Colonel [Kenneth] Nichols and Colonel Naumer, N-a-u-m-e-r, and Colonel Herbert Gee and Colonel [Gerald] Tyler. They were all heads of the Manhattan District up there. Sherwin: How about [John] Lansdale? McKibbin: He’s been in the office, but I wouldn’t recognize him if I saw him now. McKibbin: Well, they weren’t assigned to hound him and they weren’t assigned to bug his house and his home and his yard. That was just a special squad picked for that, and they were on his trail every instant. They say when he was in Washington to see the General—he was in Washington a great deal of the time—they were at him all the time. He fainted right at his desk, but he had to run this project with all those prima donnas and all those great scientists and all those fine people. To keep the program going on one line or two or anything to get it done, and then to have these people yipping at his heels about stories that were kind of old was pretty, I would say, boring, except that it got at you. But security is something nobody’s every criticized. He went home for lunch one day and forgot his pass, and the guard in front of his residence wouldn’t let him in until he got his pass. McKibbin: Yeah, that’s all right. That’s not asking him questions or anything like that. Sherwin: Right. Well, that’s what you call tight security. McKibbin: Security was excellent. They would say to me, the man who came in my office confidentially, they would say, “What we’re afraid of is someone in the laboratory.” Of course, the scientists were too busy to think about things like that, and they were too busy to think of what’s going to happened if it worked and what would happen to the world. They got very worked up about it, as you know, as the progress came on. Alice Kimball Smith has written a marvelous book called The Peril and the Hope. Sherwin: Hope, yes, I’ve read that. McKibbin: She is going to publish her letters of Oppenheimer this fall at Harvard University Press, and those you must read. Sherwin: Oh, I’ve read them. I read them for the Press and did a report on that, and recommended that they publish them. McKibbin: Yeah, well, did you do the last part? She said she’s doing it from ’43 on. She originally started to ’43 and then she told me on the telephone she was going to do it ’43 on for a year or two. Sherwin: Yeah, it’s up to ’45. McKibbin: Oh, yeah, that’s it. Sherwin: In fact, there’s a couple of things afterwards, too. I suggested that they put in a few things for the post-war period. Yeah, it’s a wonderful collection, very much nice. McKibbin: She’s an excellent scholar. The people were very excited about that and Willy Higinbotham left the Hill. He was a scientist, as you know, and went to Washington and took an apartment to try and see if they’d have a trial [of the bomb] and invite Japan to watch it. But we didn’t have enough material to do that. Or, if they could tell Japan about it. Things were going along and we were at war, and so they dropped it. The decision, I understand, was made by Mr. [Henry] Stimson. McKibbin: Harry Truman, they say, when Roosevelt died, it took them seven hours to brief him on what had been going on. Sherwin: Yeah. He didn’t get briefed for quite a few days afterwards about that. McKibbin: It’s terrible that Roosevelt died when he did. He was to visit Los Alamos, the next visit he ,ade. He’d never been here, and he died before he got here. Sherwin: I heard Robert Oppenheimer had made a very moving, short moving speech on Roosevelt’s death when he announced it. Do you know anything about that? McKibbin: No. At the time, I think I had a copy and I can’t find it in these files we’re going through. Any speech he made was just marvelous. He composed it a few minutes before he made it. Sherwin: Yes, he was brilliant. McKibbin: You could see from the look on his face that he wasn’t hearing what you were saying, so you never said anything. You knew what he’s doing and this was for the Big E award. I heard him do that, and it was tremendous. Sherwin: Yes. Oh, that, that’s a beautiful speech. McKibbin: He was a poet, you know. McKibbin: He wrote for the Hound & Horn. McKibbin: Yes. Have you some of his poems? McKibbin: Yeah. He learned Sanskrit, you know, so quickly, and had seven other languages. Sherwin: Yeah, he was an amazing intellect, and beautiful sense of language, feeling and everything else. Where was this speech made? McKibbin: Oh, you go up the Hill. Stan took you up the back way, if you went by the Meson facility. If you’d gone straight ahead, they call it the Hill, because it’s such an abrupt rise. McKibbin: You get up to the Hill, and there was a huge grandstand where they played baseball on the right just as you were kind of entering, before you even got to the motor pool and that business. It was held there, and it overlooked the Sangre de Cristo Mountains. There’s nothing between us and the sixty miles where the mountains were. It was a day just like this. It was in the afternoon, and they were there and generals and Army and Navy and everything. There was Robert in his porkpie hat, pacing up and down in front. I knew he was writing his speech, because you could see it going on inside him all the way down to his toes. They all spoke and he, of course, had a wonderful speech. Lots of people were there; it was a great celebration. We’d been so ingrown up there and not allowed to even have people come in. Of course, these were all people connected with the project who came in. But he spoke beautifully. When he was a young professor in those universities of Cal Tech and Berkeley, they say at the parties, you’d look into a room or a hall, and if you saw a crowd gathered around someone, they were gathered around him, because he liked people so much, especially people that could understand what he’s talking about. All the young people, he gave them a lot of attention. Sherwin: Yes, he was a great teacher. McKibbin: He influenced so many young men. You can just see, when they’d come in my office with a group that worked with Oppenheimer, before they even came out here from Berkeley or Cal Tech, you know. Those people, they had a sort of a mystic feeling toward each other because of studying this with someone who inspired them so much. Sherwin: Do you remember the names of particular people? McKibbin: Well, of course, there was Robert Serber, but he was up high. There were a lot of younger ones and I don’t remember, no. I’d have to give them a pass and I’d write it down and they’d write it in triplicate, and it went out that way. [Richard] Feynman was devoted to him. I’m sure he worked with him, but he was so well-known himself that I never associated him with Robert’s group, but I imagine he was. Sherwin: No, actually, Feynman didn’t work with Robert. Sherwin: He worked at Los Alamos, but he was not a student of Robert. McKibbin: Yes, I know he worked at Los Alamos. He has cancer, too. Sherwin: Oh, is that right? Sherwin: Oh, terrible. Is it terminal? McKibbin: I don’t know. I just heard he has it, and whether they caught it and therapy’s doing it, I don’t know. But he is a man who talked to President [Dwight] Eisenhower for, we say, twenty-four hours, telling him he should not let this hearing, they call it, of Oppenheimer take place. But it made no impression whatever. McKibbin: Oh, yes. And Captain Parsons, Deak Parsons, was on his way. He had an appointment one morning with Eisenhower. There had been an official party the night before, and you know, you have food and rich food and drinks and things. He had a pain and he thought he’d stop by on the way to the President’s office to see his doctor, who did an examination a week or so before, said he was in fine shape. He fell dead on the floor of the doctor’s office. So he never talked to Eisenhower. It wouldn’t have made any difference. [Isador I.] Rabi told me, too, that all the people that testified in this purge, there were thirty-eight of the great scientists that testified for him. Rabi said, “Didn’t make any more impression as if they hadn’t opened their mouth.” So let’s don’t get back to that again. But these young people that studied and were influenced by Robert. They’re marked. McKibbin: Have you talked to [Hans] Bethe? Sherwin: Oh, yes. Bethe wrote an introduction for my first book. Sherwin: He’s been very supportive over the years. McKibbin: The book fascinates me, where you talk about these big lads and it was all high stuff and political. Did you bring in the Acheson-Lilienthal report? Sherwin: That’s after. This is only up to Hiroshima.